Sakaide has a population of 62,000. It is a port city located in the central part of Kagawa Prefecture on the island of Shikoku in southwest Japan. The city is situated on the Ayagawa River which runs north and south and is southeast of low-lying mountains. The combination of mountains, river and inland sea blend well to form an area rich in scenic beauty. A temperate climate makes Sakaide a comfortable place to live. While Sakaide’s major crop used to be rice, their practices have been changing into more of a suburban type of agriculture that includes vegetables, fruits and livestock. Sakaide and Sausalito share many geographic similarities being both water-based communities. 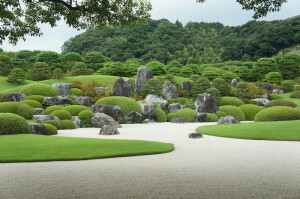 Shikoku, the island upon which Sakaide is located, was a peaceful, harmonious island that, for many centuries, relied on the production from its numerous salt fields. In 1972 a new method was developed that revolutionized salt production and this technology eliminated the need for salt fields. The salt fields were converted to other uses such as an electrical power station, shipbuilding and the petroleum industry. Sakaide became a harbor city and an important industrial region. Through land reclamation, many of the numerous islands that comprise the region were joined and Bannosu Harbor became a focal point. A new dam, Fuchu Dam, was built in1967 to accommodate anticipated growth while also creating a beautiful recreation area for personal enjoyment. To further promote transportation and commerce between the islands, a major project that some considered Japan’s “greatest project of the 20th century” commenced. The Seto Grand Bridge includes a series of 11 bridges and viaducts and was built at a cost of $9 billion. Its six bridges connect five small islands and were designed to harmonize with the nature around them. 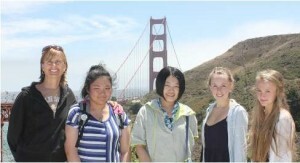 In one of its many inaugurating ceremonies, the Seto Grand Bridge became the “sister” bridge of the Golden Gate Bridge with the ceremony being attended by a Marin County delegation in 1988. Sausalito is one of the top 20 destinations for tourists in America today. It is the first city on the northern end of the Golden Gate Bridge in Marin County and has a population of 7,099. Built facing the Bay, its terrain consists of steep, wooded hillsides and shoreline tidal flats. Its history has included fishing and being a shipbuilding center during World War II and a center for the music industry. It has three houseboat communities, a rich community life, and a strong business and food sector with well-known restaurants. It is a haven for boat building, yachting, and the artistic community. It has a well-renowned prestigious Annual Art Festival in September and caters to tourists who visit by car, bus, ferry and cycling across the Golden Gate Bridge.